Healthy Alternative for King Cake. You will need: 2 cans of reduced fat cinnamon rolls, 1 ½ cups of shredded coconut, Food coloring, Cinnamon, ½ cup of Chopped Mixed Nuts (Optional), ¾ cup of Milk, Assorted fruits for filling- Suggestions include: Peaches, Bananas, Kiwi, Strawberries, Raspberries, Blackberries, Apples. Place cinnamon rolls along a baking sheet in a circle overlapping one another. Next, spoon in the cut fruit fillings of your choice. Then sprinkle with cinnamon and wrap the cinnamon rolls over to encase the filling. Bake according to the directions on the cinnamon roll package. For the toppings: Place ¼ cup of milk, ½ cup of coconut and the desired food coloring into a bowl and let the coconut absorb the food coloring. Repeat this for each color. 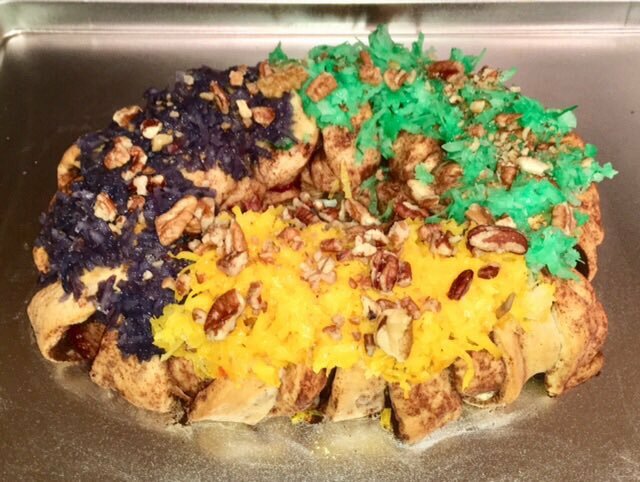 Once the king cake has cooled decorate with coconut, mixed nuts (optional) and serve.